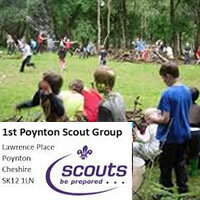 1st Poynton Scout Group has been running for many years, and has gone from strength to strength. A dedicated team of leaders ensure that content is varied, interesting and keeps the beavers, cubs, scouts and explorers engaged. Activities are wide ranging, include 4 scouts camps per year, around 4 cub camps and a traditional Group camp, this year seeing 73 beavers, cubs, scouts and explorers join in with games and activities. This years scout summer camp will include a visit to Brownsea island, the home of the first ever scout camp.